A Day To Remember have confirmed they will be self-releasing their long-awaited new album Common Courtesy this Tuesday (October 8th). A message from the band can be found below. Pre-orders for the upcoming full-length can be found here. Don't forget, ADTR are currently touring across the country alongside All Time Low and Pierce The Veil. Remaining dates and ticket information can be found here. 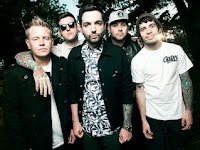 "In May of 2011 we joined the long list of bands that have filed suit against Victory Records. Although our case is still ongoing, we are very pleased with the judge’s decision to allow us to release our next record. The only thing that has mattered to us while dealing with this lawsuit was getting new music to our fans. We are finally going to do that on October 8th and we couldn't be more excited!"